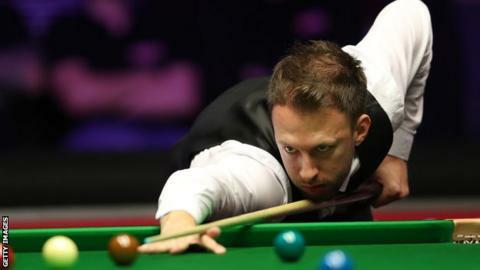 Judd Trump sealed a third successive victory over world number one Mark Selby, winning 5-1 to reach the semi-finals of the World Grand Prix. The 29-year-old world number five made a 77 in the opening frame and raced 3-0 ahead at Cheltenham Racecourse. He added a 102 and was on a break of 67 in the next when Selby jokingly threw his towel on the table to concede. Trump will play Barry Hawkins in the last four after the world number seven beat Kyren Wilson 5-2. Masters champion Trump was clearly unaffected by a 20-minute delay to the afternoon’s proceedings, caused by a problem with the roof at the racecourse’s Centaur venue following heavy overnight rain. Ali Carter and Xiao Guodong will contest the first semi-final on Friday evening.